Dr. Goat put on his coat and went out to make some calls. ... D.G. goes out and administers to his animal patients. 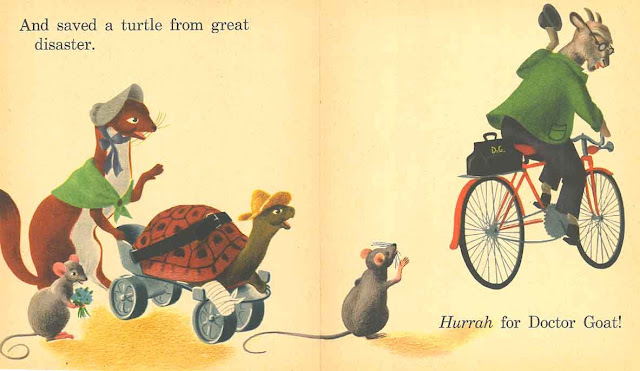 He gives a walrus a mustard plaster, a bat some red pills and a turtle with a broken leg a skate to ride around on. Well, when D.G. 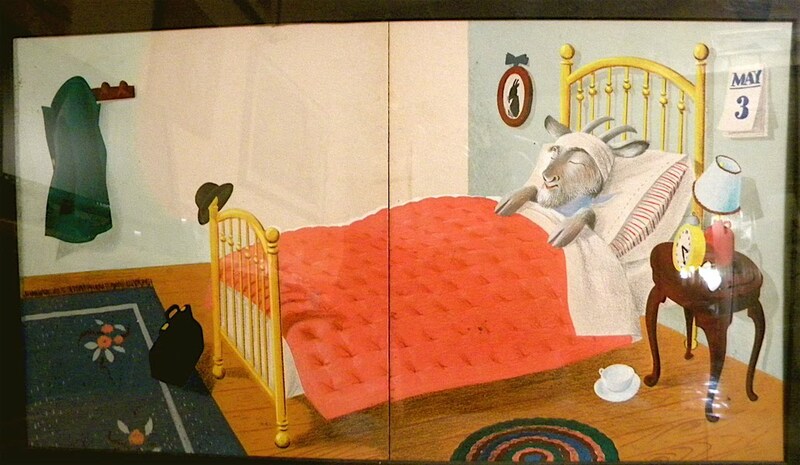 gets sick himself and is confined to bed, all the animals show up to take care of him. In the end, of course, D.G. is healed and gets well enough to go out and take care of his friends again. A simple tale that obviously struck a cord with alot of former little people as copies of the wee book can go for upwards of $75. According to Peter, the author Georgiana (or Georgie as his Uncle Charlie used to call her) was a close friend and also acted as Charles' book agent. Who knew that a friendship from more than 60 years ago would still be alive so strong today, if nowhere else than the hearts and minds of those who remember Dr. Goat and his helping ways. Above is the original cover of the book, and below are scans of the reprint cover, some pages from the book, and some photographs of the original artwork that still hangs in Peter's home. These illustrations look very familiar. Maybe I had that book as a kid, or other books by the same author. I would love to have the script from the book....it would really be more like a little poem. Do you know them??? It was "Pink pills for an owl with fuzz on his tongue, BLUE pills for a BAT who was very highstrung" if memory serves me correctly. 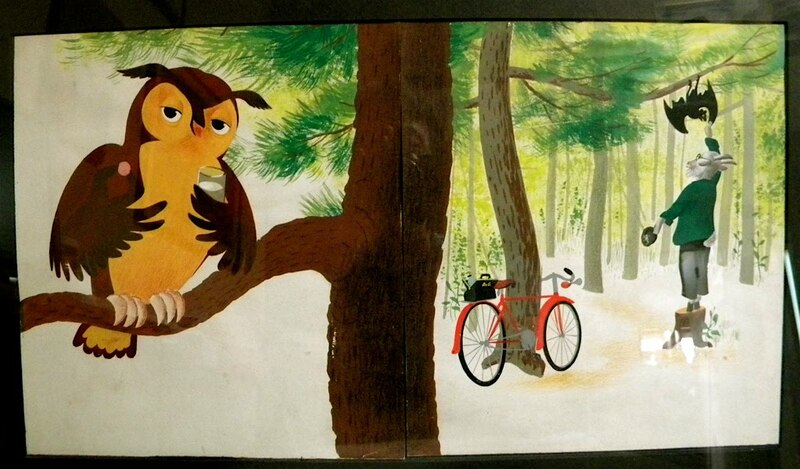 MARVELOUS children's book! I read that someone had posted this book to a pdf file. I'm assuming that's not legal. I went to the site but it had been shut down in 2009. Has anyone seen it? This has been on my list of books to find since I read about it on your blog. Our county library system doesn't own a copy, and of course it's prohibitively expensive to buy. So I just attempted to get a copy through interlibrary loan. The librarian called this week to tell me that only one library in the U.S. has the book (at least of the libraries participating in the interlibrary loan program), and that library, not surprisingly, isn't willing to loan it out. I hadn't imagined it would be so difficult to find the book. At any rate, I'm so glad to see scans of some of the pages on your website and to read the text of the book through the link provided in a prior comment. How sad that a book loved by so many is largely inaccessible now. I have this wonderful book (blue cover) but unfortunately some of the pages are missing. This was my favorite as a small child and is was read to me and reread. I would love to find a good copy that I could actually afford! :o) I agree that it really should be reprinted. Wish we could plant the spark to get that done. This is such a beautiful book! And what a lovely blog, right up my street. Thanks, I will hang out here, it's a nice place to be! What a lovely thing to say. Thanks! 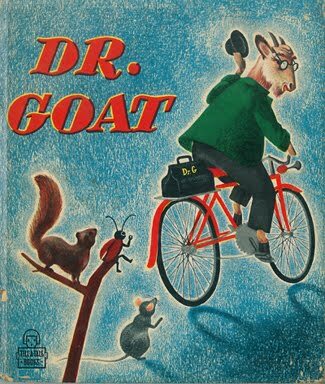 I had this book as a kid in the 60s -- one of my favorites. My mom sent it to me when I had my own little one, and it was once more well-loved. I had no idea it was so sought after! I will hold on to mine until my son, who is 30, has his own kids. I'm about to be able to read this wonderful book to the 5th generation in our family. I have kept it safe for several more generations to enjoy hopefully. I loved this book as a kid, and had many golden books as a child. Unfortunatley when my parents split the books were given away, a real crime to me. I have been unable to find a copy of this wonderful book. My Great Grandmother read me Dr. Goat when I was a child and I eventually had the whole book committed to memory. To impress her friends she would have me "read" it. She would turn the pages on cue, and I would recite from memory the words. I loved this book. 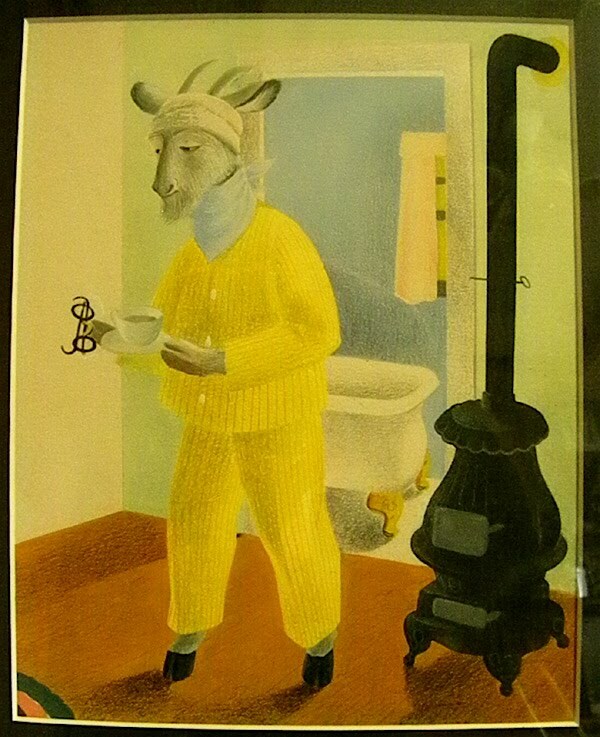 Seeing Maurice Sendak last night on Colbert made me think of Children's books I loved which in turn made me think of this. I am so happy to find that other people have great memories of this too. 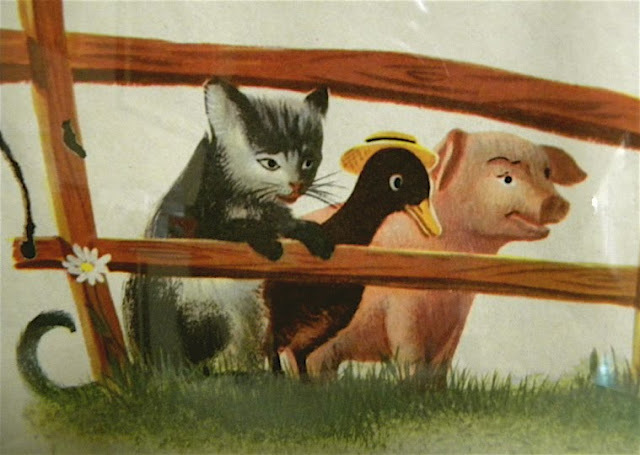 BTW I had the Little Red Hen books as well. 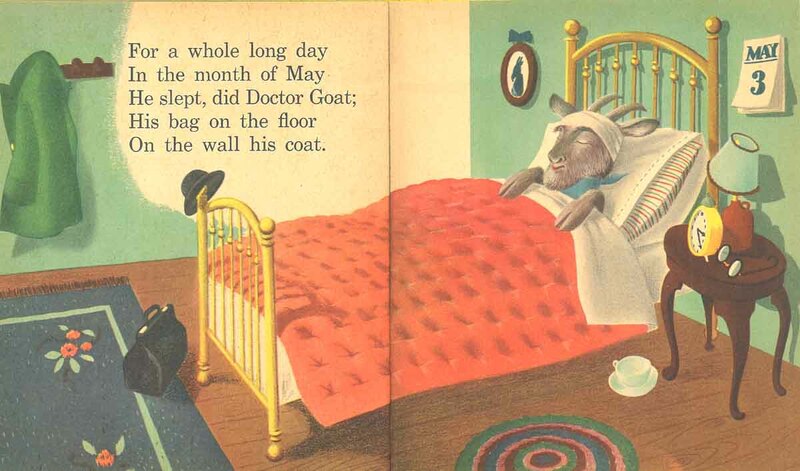 "Three cheers for Doctor Goat!" I seem to remember a verse, "He cured an owl that had the mumps, He cured a frog that had the jumps"
This was the first childrens book my mother read to me, along with Rootie Kazootie Baseball Star. The prices for this old book are way to high for me to ever own it again, but what a darling story for a child. I seem to remember Dr. Goat also gave a mustard plaster to a walrus who had a cold. I had to ask my mother what a mustard plaster was. I assumed it was something similar to Vicks! I believe my mother still has this book and has read it to my kids as well. A golden oldie. --her final gift of love to me. We loved Dr. Goat as children. 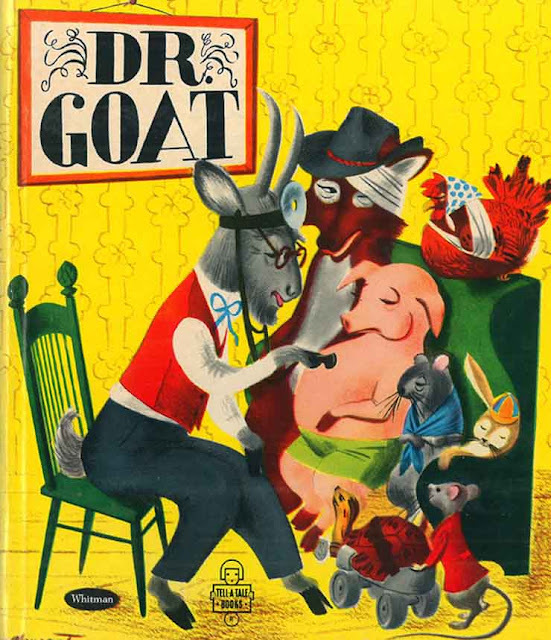 We even called our family doc Dr.Goat! (I guess we thought there was a resemblance?) I have a copy of the book and am now reading it to my grandkids. Of course, they love it too. We all have it memorized from childhood and have been known to break out in a recitation when we're all together. Love that book! Had this book as a kid 60-odd years ago and STILL have it! It was my all-time favorite Little Golden Book. It will always be near and dear to my heart.